The market fell on renewed trade fears and could signal a general collapse in equity prices. Losses were broad but not too deep so it is possible today's action is just reaction to bad news. The news, a Trump/Xi meeting is unlikely before the March 1st tariff-deadline. Trump and Xi want to meet after Trump meets with Kim Jong Un, that meeting is slated for the final days of the months, and there are still differences that need to be resolved before a date can be set. The real question is tariffs. The March 1st deadline is the trigger for a doubling of tariffs already in place on Chinese goods, will the tariffs be halted or will they be triggered as planned, and if so how is that going to impact the negotiations, global economic outlook, earnings estimate, and the equity market? Adding to today's woe are two additional voices in the chorus of those harmonizing on the risk of US/China trade relations to global economic growth. The first is from the ECB, the ECB issued the first volume of the 2019 Economic Bulletin and Update and the update is not good. The ECB says geopolitical uncertainty (ahem, US/China trade relations) are curtailing growth. Economic indicators are coming in worse than expected and point to slower than expected growth in the EU despite underlying strength in domestic activity. The ECB has lowered its GDP target for this year and next by several tenths but there is good news; domestic economies are still strong, economic conditions are favorable, labor markets are healthy, and wages are growing. Looking forward, EU GDP growth is expected to expand in 2020 but will be subdued if trade-relations are not resolved and global trade remains constrained. In the UK the Bank of England held its rates unchanged but issued a warning. The BoE says the UK could see the slowest growth since 2009 as Brexit concerns and global trade curb activity. The bank lowered its already diminished GDP outlook to 1.2% and this could go much lower if the Brexit isn't resolved. There are 50 days to go. Initial claims for unemployment fell a less than expected -19,000 to 234,000. The previous week's figure is not revised and the four-week moving average of claims rose 4,500 keeping the number of first-time claims moving sideways. On a not adjusted basis claims rose 2.0% versus an expected 9.2% and are up from the same time last year. There is no specific mention of the shutdown in the data but the number of new civilian claims rose 17,277 in the last week and has been rising over steadily over the past few weeks. 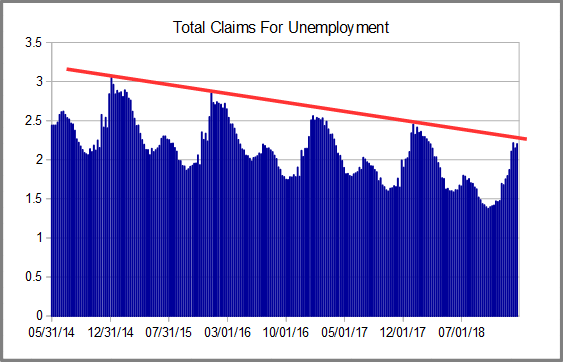 Regardless, claims continue to trend near the long-term lows and are consistent with healthy labor markets so nothing to worry about here. The number of continuing claims fell -42,000 to 1.736 million. 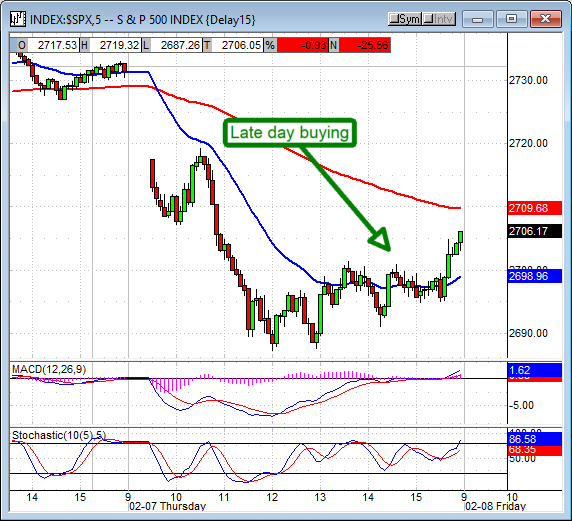 This is on top of a downward revision to last week, -4,000, and brings the four-week moving average to 220,250. The number of claims and the moving average have been rising over the last two months and that is a concern. Despite that concern, the number of continuation claims continues to trend near long-term lows and is consistent with labor market health. The total number of claims increased by an expected 54,515 to hit 2.203 million. 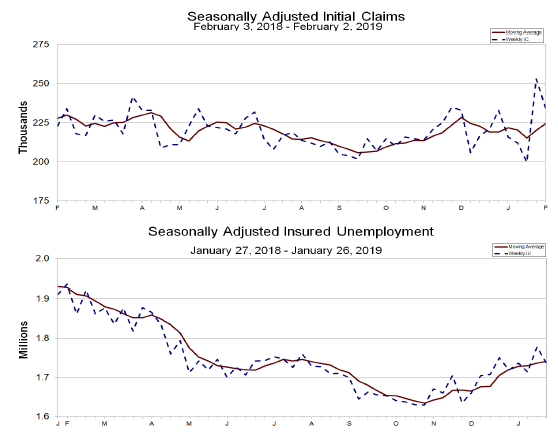 The number of claims is topping out at a seasonal peak (expected) and should begin to subside in the next two weeks. 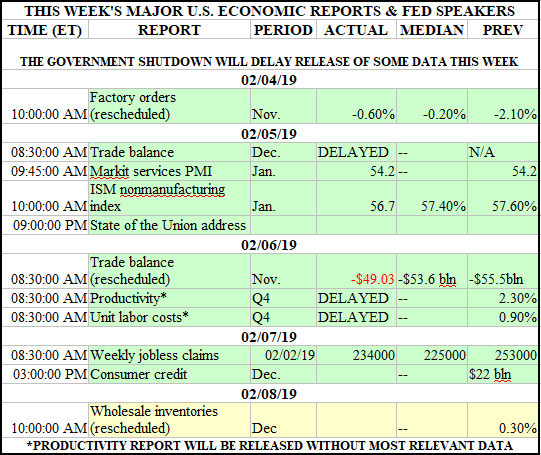 The only questions are how the shutdown will impact the data, and if employment trends are still positive (other data points say yes). My next target for total claims is a decline to 1.5 million by late spring. The Dollar Index got a boost this morning from the BOE and ECB. 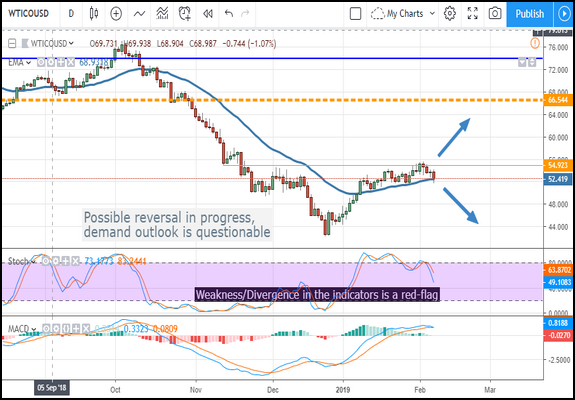 The two central banks have confirmed relaxing their outlook for the coming year and offset weakness in the dollar sparked by a similar outlook from the FOMC. Today's gains were capped though, at resistance, and may not be able to move higher. Resistance is at $96.50 where it kicked in last month. The indicators are bullish so a move to retest resistance is likely, a move above that would be bullish. Gold prices were able to regain some of yesterday's losses on today's trade news. The news ups the ante for the expected Trump/Xi meeting, a meeting that not materialize at all (I shouldn't forget). 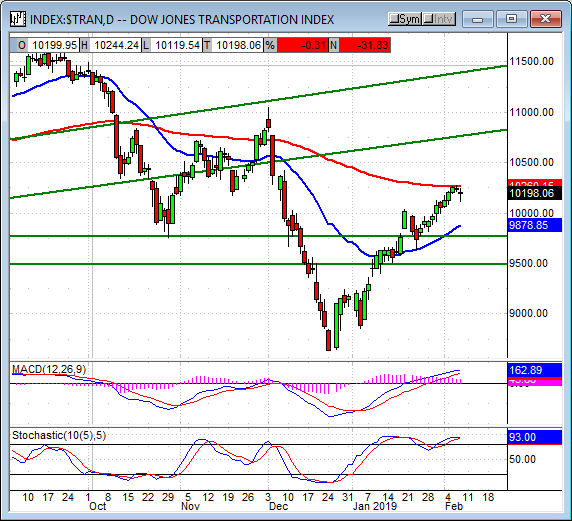 Today's move confirms support is still present above the $1,300 level but the move is not decisive. 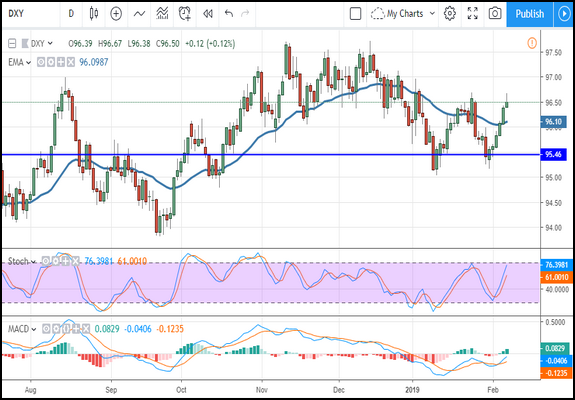 Downward drift may continue if the dollar strengthens, support may be found near $1,300. A move up would be bullish but new directional trades shouldn't be considered until new highs are set. 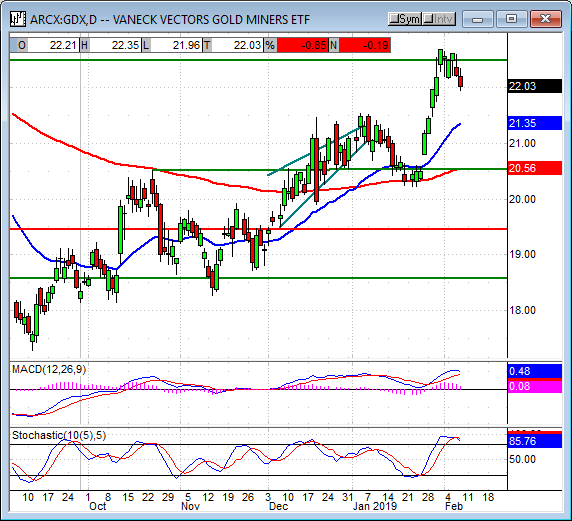 The Gold Miners ETF GDX fell again today and set a new one week low. This low breaks the short congestion band which formed over the last week and may indicate rejection of prices at the key level of $22.50. This level has been an important pivot point for nearly three years and strong resistance is likely even if prices do move eventually higher. The indicators are rolling over as well which suggests consolidation in the least and pullback to support at worst. If the ETF does move lower support is possible at $21.00. Oil prices moved lower on today's news. Trade uncertainty and declining prospects for economic activity are sapping outlook for oil demand and offsetting signs of market tightening. 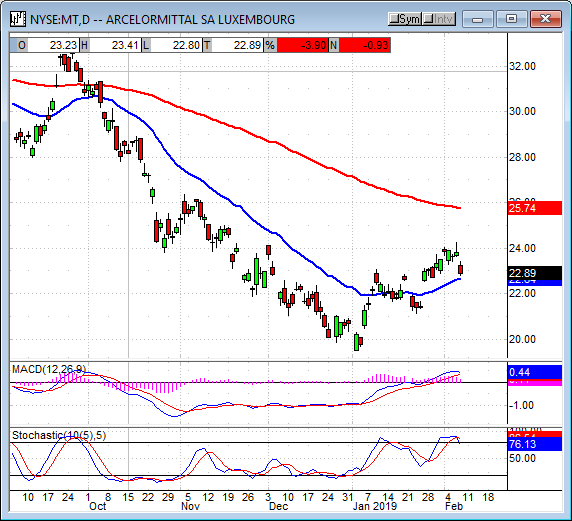 The price of WTI fell about -3.0% intraday but found support near $52.40 and the short-term moving average. Prices ma move higher but without positive catalysts to support them range-bound trading is the best we can expect. 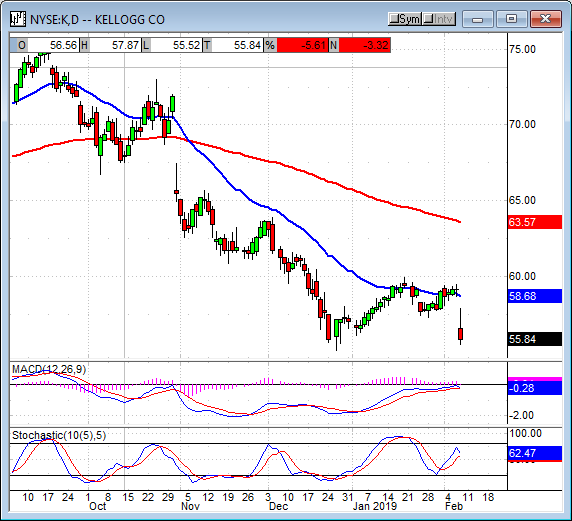 If prices move below the short-term moving average a decline to $48 or $44 is possible. 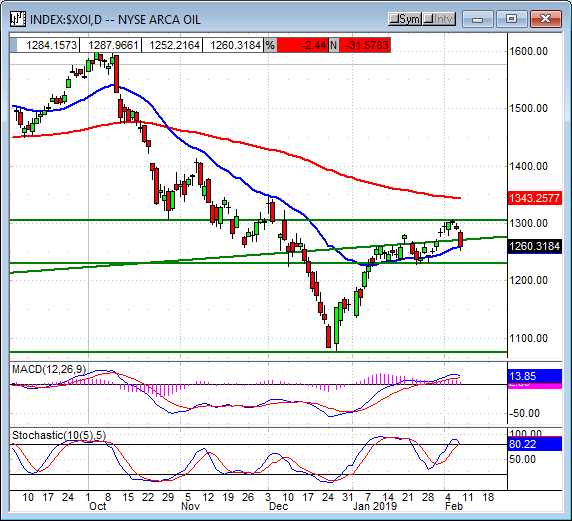 The Oil Index fell in today's action and confirms support at the 1,300 level. 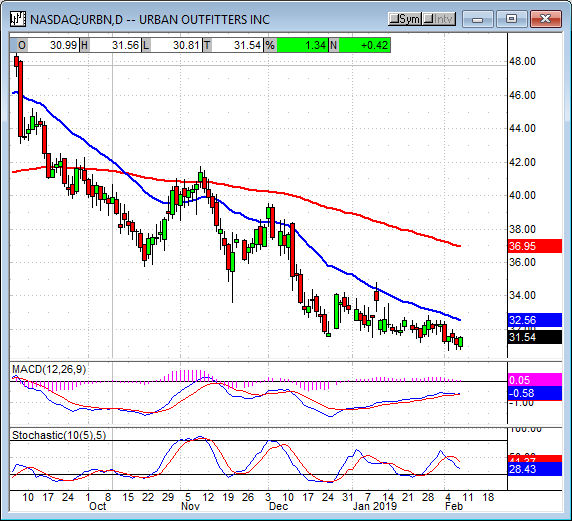 The move takes the index below my long-term uptrend line but found support at the short-term moving average. The index is still in consolidation so sideways movement should be expected in the near to short-term. Because the indicators are so weak and showing strong divergence I suspect a deeper fall may be coming, possibly to 1,220 or lower. A move below 1,220 would be very bearish for this sector. 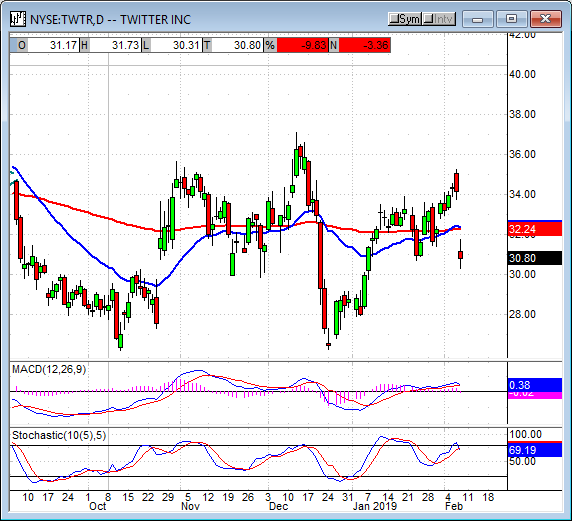 Twitter moved sharply lower in today's session after beating earnings outlook on the top and bottom lines. The company says average monthly daily users is on the rise but weaker revenue and rising costs are going to hurt the bottom line. Twitter has been shifting to a more news-centric approach and that is costing them dollars, news attracts users but it doesn't convert to dollars the way other types of traffic do. Shares of TWTR fell -10.00% on the news. Kellogg's beat forecasts as sales trends begin to stabilize. The maker of iconic breakfast foods and snacks says next year should see revenue grow 3% to 4% with EPS growth of -4% to -7%(effect of tax reform wears off). The guidance is better than expected and helped shares move higher in the pre-opening session. Later, but before the open, shares reversed their climb to fall more than -5.0% as traders cash out in favor of other steady dividend payers that do have positive EPS growth in the forecast. Arcelor Mittal, one of the world's largest steel producers, beat revenue and earnings estimates soundly. Shares of the stock fell, however, on the outlook for moderating demand and expectations for weak revenue and EPS growth. The company still sees demand growing by 0.5% to 1.0% but the lower outlook and declining prices are going to hurt bottom line results. Shares of the stock fell more than -4.0% despite a doubling of the dividend distribution and increased share buyback. 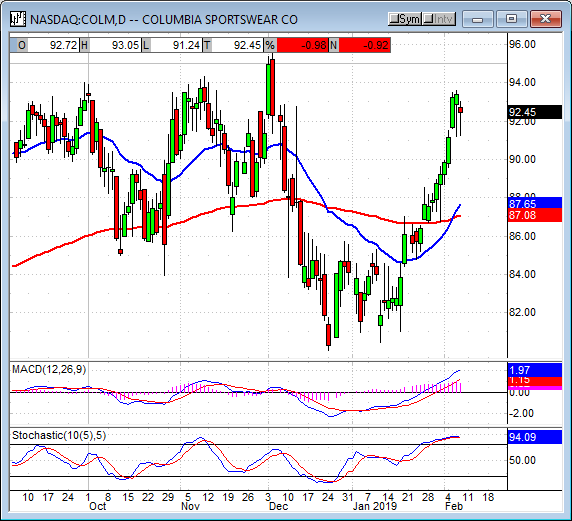 Shares of Columbia Sportswear surged more than 11% in after-hours trading after the company proved consumer spending is robust. The company grew revenue 16% over the last year, improving operating income by 34%, and expects to see strength all year. The guidance is well above, not just a little but well above, the analyst's consensus $4.09 at $4.30 to $4.45 for the year. Urban Outfitters was not so fortunate. The company reported light on revenue and gave a soft outlook for the full year. Shares fell -4.0% in after-hours trading. 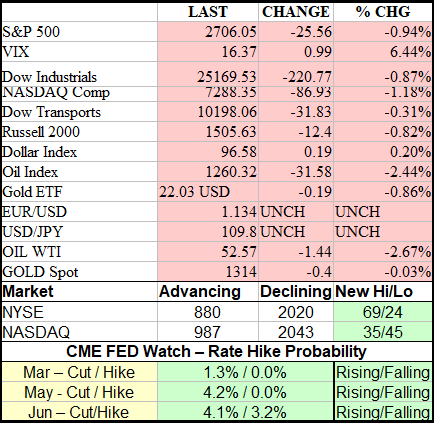 The indices moved lower today on a round of negatively charged news but the moves weren't that big. The indices had a heads-up moment on some news we already knew, the 2018 updraft in equity prices is still intact. Today's action was led by Dow Jones Transportation Average which closed with a loss of only -0.31% after tickling -0.50% intraday. 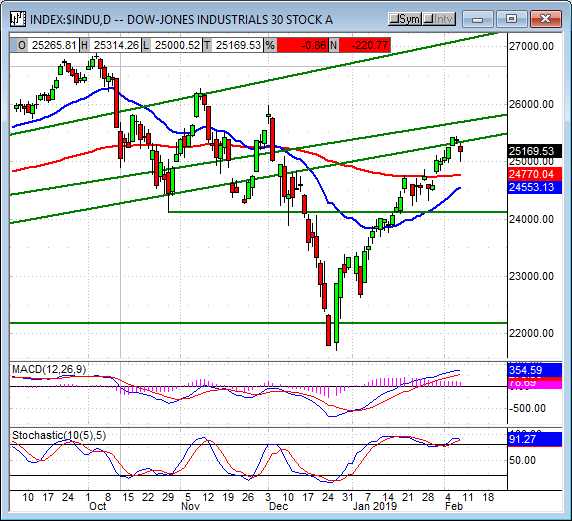 The index created a small doji candle just below Wednesday's candle and the long-term moving average but within the five-day range so is not that bad looking. The indicators are consistent with the index hitting a peak and entering consolidation and that is what looks like is happening. A move lower may come but will likely find support near 10,000 or 9,750 unless the news worsens. 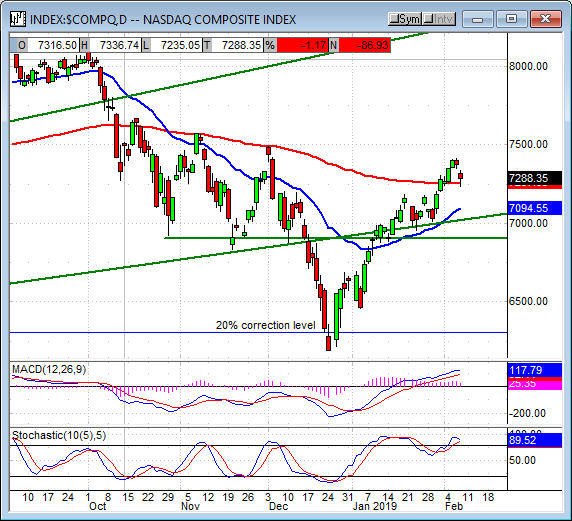 The NASDAQ Composite posted the largest decline with a drop of -1.18%. The tech-heavy index is now testing support at the long-term moving average and so far support is present. The indicators are consistent with consolidation at this level so the moving average may be tested again, sideways action should be expected regardless. 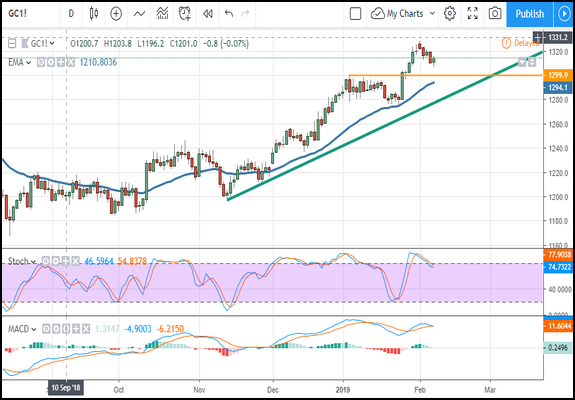 A break below the 150-day EMA would be bearish and could take the index down to 7,100, a move higher would be bullish and may lead to a retest of 7,500. The S&P 500 closed with a loss of -0.94%. The broad-market index created a small red candle with a visible lower shadow after testing support at the long-term moving average. So far, support is present at the EMA but the indicators suggest this is not the last time it will be tested. 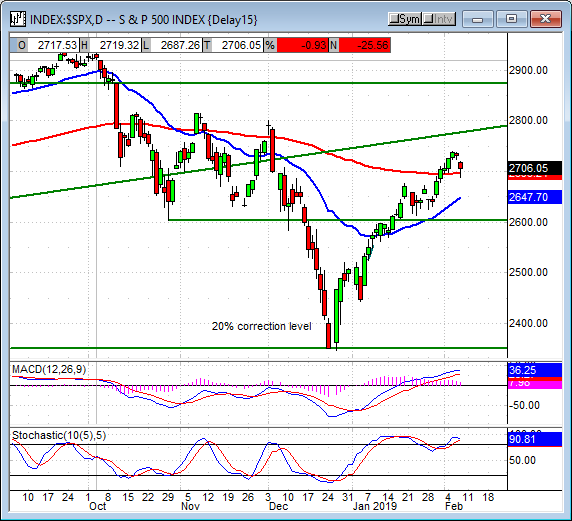 A move below 2,700 could be bullish and may lead the index down to 2,650. A move up would be bullish and confirm support at the EMA, my target, in that case, would be 2,730 and 2,775 in the near-term. The Dow Jones Industrial Average closed with a loss of -0.87% after trading much lower intraday. The blue-chip index created a small hammer-like candle showing support at the 25,000 level and indicating a possible move higher. The indicators are bullish but consistent with near-term weakness/consolidation so sideways action is expected over the next few days. A move lower may result in a fall to 24,775 and the long-term moving average, a move up would confirm support at this level. The indices moved lower on today's news but the moves weren't that strong, the news wasn't that bad (it certainly wasn't new news, just regurgitated news from new sources), and the outlook for 2019 and 2020 is the same; slower growth than first thought but growth, and growth that will expand into 2020. Today's news and price action could result in a general market breakdown but I don't think so, not yet. There is still hope for the trade deal, it wasn't 86'd the date of the meeting is just a little later than we first thought. Until the trade talks do break down I am firmly bullish for the long-term and long-term positions. I am cautiously bullish for the near-term, leaning toward neutral, with my fingers crossed trade news continues to trend positively.